This year's Bash will be held from Wednesday 24th to Sunday 29th June. Once again the location is our spiritual home at Stourport in Worcestershire. 1) Club finances: we currently have a surplus of £2,638 compared to a deficit last year of £1,271. 2) 237 vehicles turned up at the Bash. There were also lots of day visitors on Saturday. Next year a £2 charge will be made for day visitors and friend/family vehicles. This will be donated to the "Bongo the Elephant" fund. 4) Following the success yet again of Saturday night's band, especially their rendition of Silver Machine, The Festival Experience have been re-booked for next year. 6) Jeff Fordham proposed a rule change. 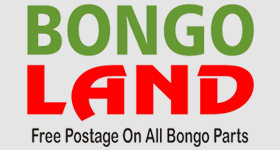 It is a sign that should be made to other Bongo drivers to acknowledge that you are an ex-Bongo owner. The Rules Committee will examine this proposal and report back. Ummm .. Maybe my intentions where right ... but I was not doing the right thing myself .. I used to attend quite a few TEOC meets .. even a couple with .. the "other Bongo" one..
With my sons poor health (he as not been out of this room for 18 months now) there as been no chance of even making a cuppa in my Bongo ..let alone get the drive away out of the shed ..!! So I 'contribute' what I can on Bongo Fury .... also several Face book sites .. where I have been plugging the Bongo Bash .. it's dedicated / communicative / knowledgeable / approachable / members for several weeks now .. even posting up links / postcodes / maps to Stourport .. Strange really as it was on my mind if this interested poster made it .. if so what they thought ..?? Sounds like my V6 ... but it wasn't mine ..!! But another convert .. so well worth the effort ..
Ian wrote: Jeff Fordham proposed a rule change. It is a sign that should be made to other Bongo drivers to acknowledge that you are an ex-Bongo owner. The Rules Committee will examine this proposal and report back. Can anyone remember what Jeff's proposed sign was? Washing windscreen while making strange hand signals? Or is that a degree of the Masons? Wasn't it wind down the window and point to the roof?